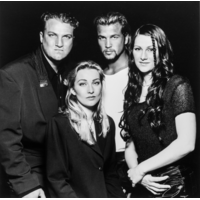 Ace of Base is a pop band based in Gothenburg, Sweden. Its original member lineup consisted of Ulf "Buddha" Ekberg and three siblings, Jonas "Joker" Berggren, Malin "Linn" Berggren and Jenny Berggren. They released four studio albums between 1993 and 2002, which sold in excess of 30 million copies worldwide. Happy Nation / The Sign is one of the world's best-selling debut albums of all time, and was certified nine times platinum in the United States. It was the first debut album to produce three number 1 singles on the Billboard Mainstream Top 40 chart: "All That She Wants", "The Sign" and "Don't Turn Around". Following the formal departure of singer Linn in 2007, the band performed a series of concerts as a trio in Europe and Asia from 2007 through 2009, before Jenny revealed in November 2009 that she would be taking indefinite leave from the band and focus on her own solo career since the band couldn't get a record contract as a trio. Jonas and Ulf have since recruited two new female vocalists, Clara Hagman and Julia Williamson. The new line-up released their first album together The Golden Ratio in September 2010.